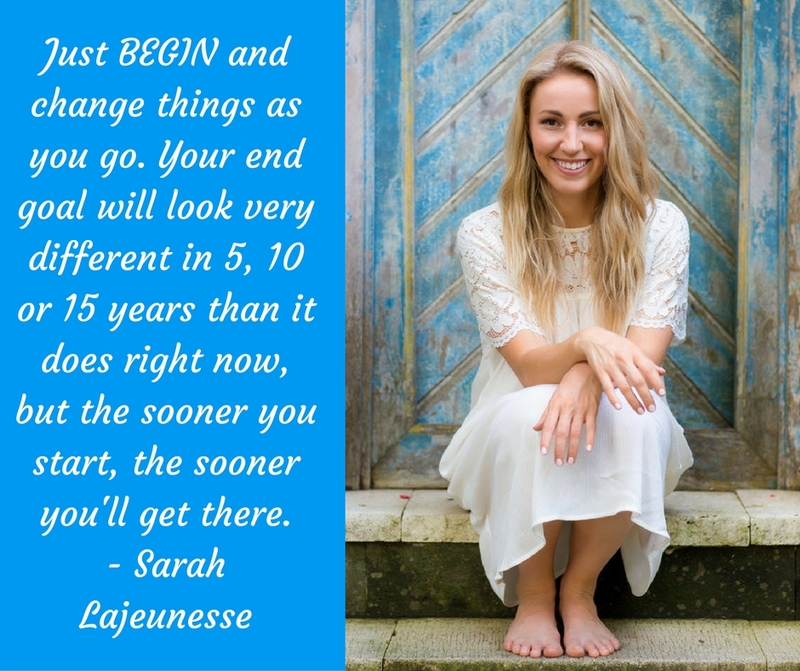 My name is Sarah Lajeunesse and I'm a Lifestyle and Wellness Coach. Though I am based out of Canada, I work with clients online from all over the world that want more out of life and are ready to step out of their comfort zone to find the courage and confidence to achieve it. I grew up wanting to work in sports management which resulted in me landing various positions with professional football organizations across the country in events, marketing and corporate sponsorships. By 25, I was awarded "Top 5 Under 25 to Watch in the Sport Industry" across Canada and shortly after was a senior manager at a professional sport league head office. Though I had accomplished my goal of working in sports at an early age, I was constantly waiting for the "next big thing" to make me feel happy and fulfilled. Yet, with every acquirement of the "next big thing", I felt a quick burst of excitement, energy and temporary fulfillment, before quickly going back to the unhappy and unfulfilled state that I was in before. I considered my career to be the only indicator of true success and as a result, everything else took a back seat. I stopped making time for exercise, proper nutrition, relationships and most importantly, self-care. I considered this type of overworked and burnt-out lifestyle to be just a "means to an end” and that I was just "earning my stripes". I knew that if I continued to put everything into my career, then the promotions, money and exposed-brick apartment would give me all the happiness I needed. In a nutshell, I became so disconnected from myself that I forgot who I was, what truly made me happy and the lifestyle that I actually wanted to live. I new I had to make big and immediate changes in order to create the life I truly wanted and through the process, I realized I wanted to help other people do the same. I suffered from a lot of stress and a string of anxiety attacks while I was working in the corporate world. I knew that if I wanted to be happy I had to make drastic changes to my entire life, not just my work/life balance. I needed to remove toxic relationships in my life and negative habits that squandered my productivity. I needed to consider the energy I was putting into my body, (television, social media, food, relationships) and remove what didn't serve or uplift me. I had to create time to discover what my passions actually were and the type of life I wanted to make, and I knew I had to make big sacrifices in order to achieve it. Once I discovered the world of life coaching and I realized I wanted to help others make lifestyle transformations like I was going through, I knew I had to make the decision from wanting to change my life to deciding to change my life, so I could walk my talk and lead by example to show others how to do the same. I began making subtle changes at first by eliminating toxic habits, activities and relationships in my life that didn’t serve or uplift me. I tried meditation, journaling and immersed myself in personal development books. I hired a health and lifestyle coach who helped me to give myself the permission to put my own self-care and wellness at the forefront of every decision. She taught me how to maximize my time and feel more energized by fuelling my body with only food that nourished me. She gave me the courage and confidence to see that my crazy and large-scale ideas were a possibility and with her help, I was able to find more vibrancy, confidence and passion than I ever thought I had so I could make those goals come to life. It was about creating more balance and time for myself to get really clear on how I wanted to spend the rest of my life and to create small, actionable steps to get me closer each day. I found a coaching academy that aligned with my values and beliefs and within a year I had graduated as a life coach from the Beautiful You Coaching Academy which is based out of Australia, launched my website and quit my corporate job and haven't looked back. Fear of failure or judgment from others. I was worried people would think this was just a "made-up" career choice. That it was just a phase or that I was a less educated and less expensive counsellor. (I've heard all of that and much more) I have been laughed at and I have been asked if I was going through a quarter-life crisis. As long as I am passionate, authentic and certain of my vision, I'm able to tune out others that don't support me, quite easily. My clients. I work with some of the most amazing and inspiring women that continue to motivate me everyday. I have worked with women that have overcome trauma in their life, abuse, eating disorders, addictions, self-esteem issues, lack of confidence and self-worth and so many other circumstances that they didn't/don't deserve and certainly didn't ask for. What is so incredible is their resilience and commitment to not only overcoming the obstacles, challenges or trauma that they experienced in their lives, but having the faith that there is so much more to life and they are ready to get out of their own way in order to achieve it. People get to a point in their lives where the idea of staying in a lifestyle, job, relationships, city (whatever it might be) quite literally suffocates them and they are ready once and for all to do whatever it takes to change their lives. When I see a client's energy shift from lacking any belief or worth in themselves, to suddenly realizing that they are capable of achieving whatever their dream life looks like to them, it constantly reminds me that I am doing exactly what I was meant to do. Find a coach or mentor that will help you with setting goals and working towards achieve them. Coaching/mentoring is all about discovering your vision and giving yourself the permission to start making it a reality. The most successful people realize that, regardless of the incredible heights that they've reached in their business or lives, by allowing themselves to be coachable they have an opportunity to bring their lives to the next level by learning from other's new ideas and methods to tap into the unused potential they have within themselves. Coachable people realize the impact that an outside source could make on their lives, they take what they've learned in the past yet remain open minded to learning new practices and principles. They take advice, suggestions and knowledge from others and utilize it to grow themselves, and their attitude towards bettering themselves is a "whatever it takes" type of mentality. I have a fear of public speaking. That might come to a surprise to a lot of people that know me and know how much I like to talk. Everyday I do something that makes me feel uncomfortable and push my limits so I can connect with, serve and reach more people. Though it includes a list of activities that terrify me, I committed to doing them because without stepping outside of my comfort zone and putting myself in uncomfortable situations, I can't grow or live up to my fullest capability. Whether it's launching a business, moving to a new city, writing a book or changing a career path, people wait until they are "ready" or for the perfect moment to allow themselves to begin. And guess what? There IS no perfect moment. You will NEVER feel ready for massive change. So people rarely make the leap. Within the three months since launching my business, I have already learned and applied so many new practices when working with my clients. And it will continue to evolve throughout the years over and over again, until I get it right. But the point? Just BEGIN and change things as you go. Your end goal will look very different in 5, 10 or 15 years than it does right now, but the sooner you start, the sooner you'll get there. When we started talking about certain principles and tactics to apply to my business, I said to my mentor, "I think that's a great idea, that'll be great to implement when I have a bit more experience". (My limiting beliefs and fears were flaring up in this particular area of growth.) So he asked me, "Do you want to be great now? Or 20 years for now?" What a simple yet profound question to ask yourself. 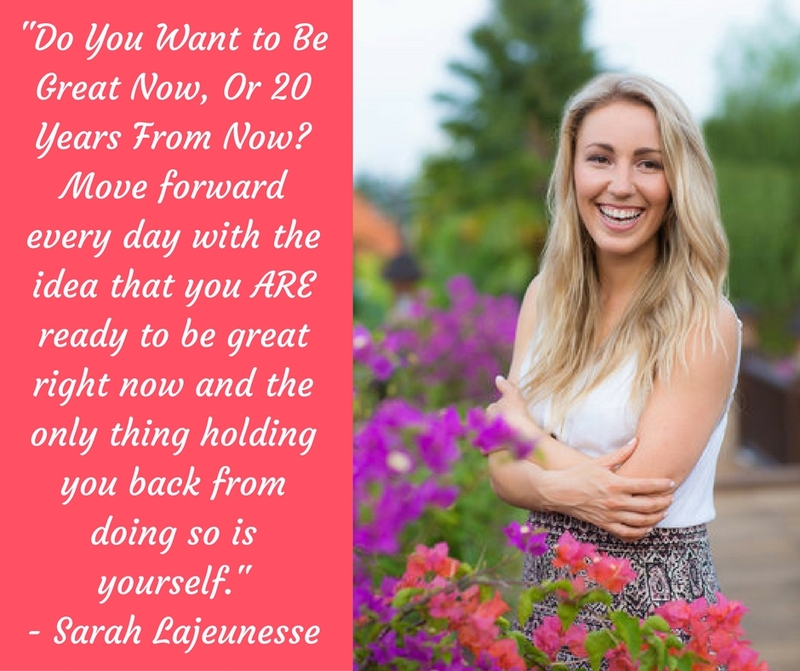 So, I challenge all of you amazing people reading this blog to ask yourself this simple question the next time you're invited to expand your horizon or implement new game-changing ideas in your life, career or business and you are tempted to wait until you have more experience and feel more ready to do so. Move forward every day with the idea that you ARE ready to be great right now and the only thing holding you back from doing so is yourself. I am working on an e-book and eventually a 30-day program for people that want immediate change in their lives. A three year plan is to host women's empowerment retreats that encompass personal/professional development with a ton of yoga/meditation and self-care thrown into the mix!